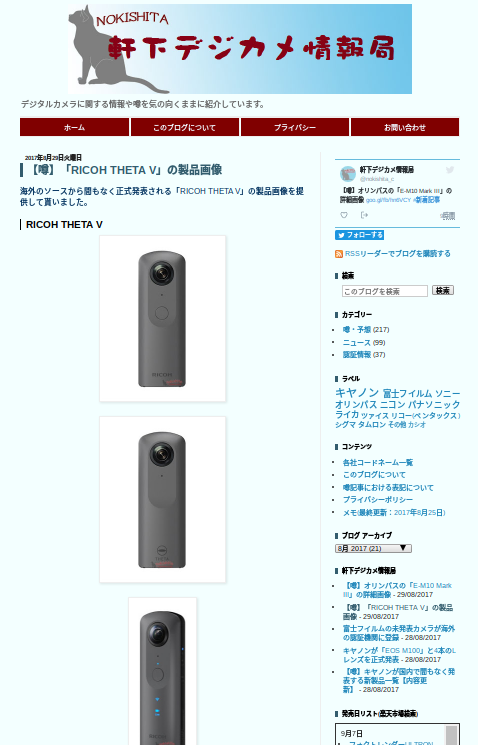 Japanese camera news and rumor site Nokishita Camera posted what they believe are photos of the rumored Ricoh Theta V (which could be the highly anticipated Theta 4K). The 4K version of the Ricoh Theta is one of the most highly anticipated 360 cameras, something 360 shooters have been waiting for the past couple of years. In April, Ricoh finally announced that they would indeed be releasing a 4K Theta by the end of 2017. About a month ago, Ricoh posted a very short sample 360 video clip of the Theta 4K, which looked impressive. Then, just a week after that, there was a photo of a “Theta V” leaked in an FCC filing. Upon further analysis, it seemed to me that the Theta V and Theta 4K were one and the same camera. 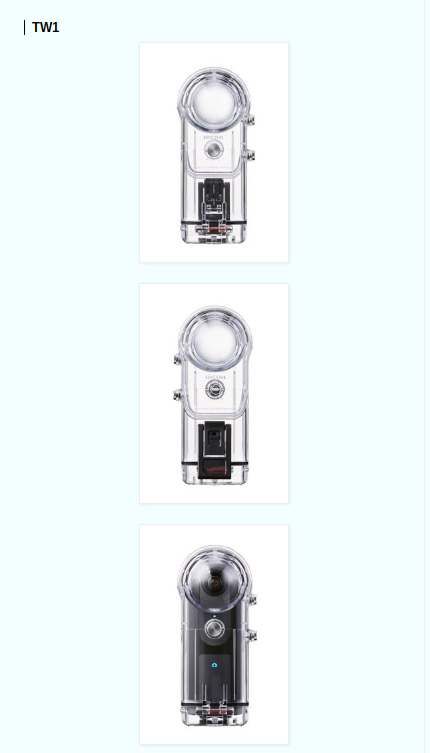 Now, Nokishita posted what they believe to be rendered images of the new Ricoh Theta V. Nokishita rated the reliability/ authenticity as “B” (trusted information), between “A” (confirmed) and “C” (credible rumor). The renderings look very good to me, and they match the photos of the “Theta V” in the FCC filing and the photos of the prototype from NAB Show. As with those photos, it looks almost identical to the Theta S, except that the bottom has what appears to be a microphone jack. Ricoh Theta V waterproof case? The other accessory shown in the Nokishita post is either a microphone or portable speaker (more likely to be a microphone). It connects to the Theta via the microphone jack and the 1/4-20 tripod attachment. 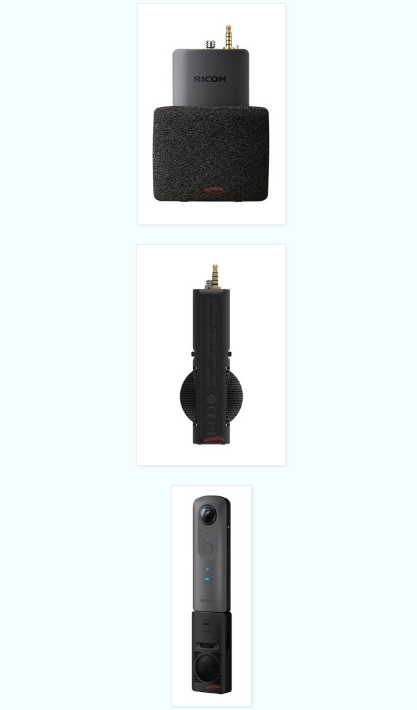 Ricoh Theta V microphone or speaker accessory? I believe we’ll find out this Thursday at IFA Berlin if these are real or not. If they are real, what do you think? Would you be interested in these accessories? Here is Nokishita’s post. Good, clean sound is important in my videos. I’ll be really interested in what happens Thursday. I’ll post a report asap! Hi Ulf. First, we’re not sure if these photos are real. Second, I would guess that you insert the mic as much as you can and then as you screw the tripod attachment, the plug goes the rest of the way in. What a champ you’re Ulf. We don’t even know if the pictures are real yet but this is 2nd negative comment about the next THETA.